Dr Fabiana Lorencatto, a post-doctoral research fellow in the School of Health Sciences, has been awarded the prestigious UK Society of Behavioural Medicine (UKSBM) Early Career Award. Recognising and reward promising early career researchers that are working in the field of behavioural medicine for their achievements, Dr Lorencatto was praised for her work in the field of Implementation Science. 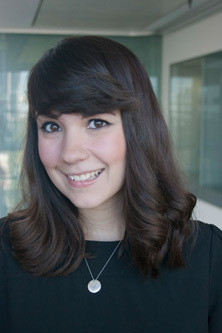 Primarily interested in the application of psychological theory to investigate the influences on healthcare professionals’ behaviours, Dr Lorencatto’s work aims to inform the development of behaviour change interventions to help healthcare professionals to use evidence more effectively and routinely in clinical practice. The award is extremely competitive and only two UKSBM Early Career Awards are typically given each year. The award consists of a certificate which is presented by the president of the UKSBM to the recipient at the annual scientific meeting. This year the presentation will made at the UKSBM conference in Cardiff on the 1st and 2nd December. The award also includes cheque for £100, and free registration for the UKSBM conference annual scientific meeting held the following year. Working under the supervision of Professor Jill Francis in the School of Health Sciences, Dr Lorencatto joined City in August 2013 having just completed a PhD at UCL (University College London). Currently Dr Lorencatto works primarily on a five year NIHR-funded programme of research that aims to develop and evaluate two theory and evidence-based audit and feedback interventions to reduce unnecessary blood transfusions in UK hospitals. In addition, Dr Lorencatto works on a number of other behaviour change and implementation research studies, including set of systematic reviews aiming to identify the barriers and enablers to patients attending diabetic retinopathy screening, and effective interventions for increasing attendance. The project is a collaboration between Optometry and Health Psychology here at City. Dr Lorencatto is also involved in teaching on the MSc in Health Psychology, supervises a range of MSc student projects and two PhD students. “It is a tremendous honour to receive this prestigious award. I am delighted and very grateful to the committee for recognizing the value of my work. “The UKSBM is a fantastic society, who do a great deal for the field of behavioural medicine. I enjoy attending their excellent conference each year. The conference is always an invaluable opportunity to disseminate my work, discuss common research challenges, and to learn from, and foster collaborations with, my multidisciplinary colleagues working in the field.